It’s no secret that at GuestRevu we’re all about helping hospitality professionals to listen to, learn and earn from their clientele. And it’s not just loyalty, trust, and insights that you stand to gain – a better reputation can actually increase revenue and reduce overheads. 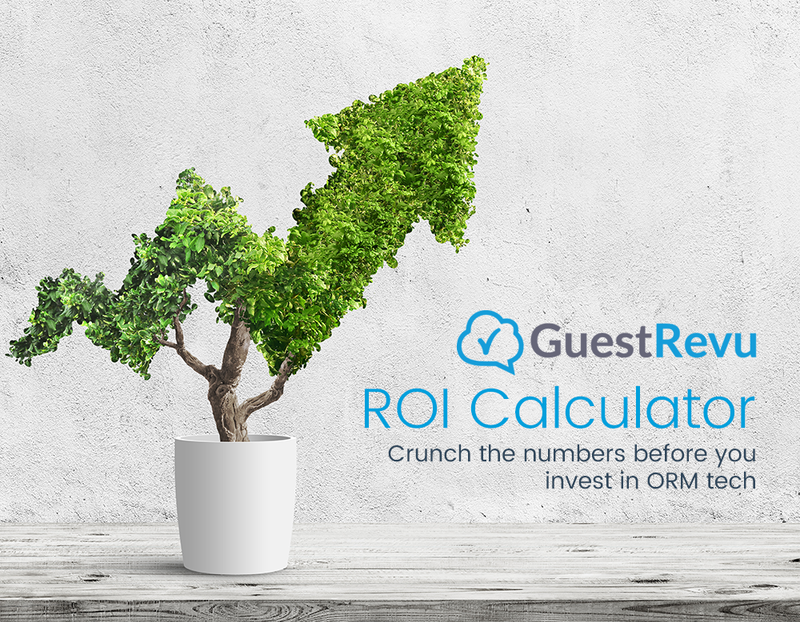 To help you get to grips with the financial impact of embracing online reputation and guest feedback management tools at your business, we’ve put together an ROI Calculator to show what kind of return on investment you can expect when buying GuestRevu. What are these figures based on? Cornell University has done some excellent research into the subject of online reputation in the hospitality sector, but one research paper in particular looked at the correlation between review scores and room pricing, hotel occupancy, and RevPAR. They found that when a hotel improves its overall online review score by as little as 1%, there is often an impact on revenue and turnover across the board, resulting in, on average, an overall 1.42% increase in revenue per available room (RevPAR) for each point out of 100 by which a hotel improves its reputation. Since GuestRevu helped hospitality professionals to increase their TripAdvisor review ratings by 4% on average in 2018, and taking into account the amount of time that our award-winning online reputation management solution saves teams in monitoring and responding to reviews across platforms like TripAdvisor, Google Reviews, Booking.com and more, we’ve been able to work out just how much of a sound investment GuestRevu’s solutions can be for your company. What makes us industry leaders in guest feedback and reputation management? Don’t make us toot our own horn — our clients can speak for themselves, and it’s their feedback that saw GuestRevu topping the HotelTechAwards in 2019 in both the Guest Feedback Software and Reputation Management categories. We can talk all day about what makes GuestRevu an excellent solution — from our world-class customer service, to our two-way integrations with PMSs like Guestline and Mews, to our personalised approach to every property and business, big or small — but sometimes you just need to see the numbers, the return on investment, or the solutions in action for yourself. Click on the banner below to request a demo from a GuestRevu consultant.